If you wish to apply for a mortgage please complete the following form. 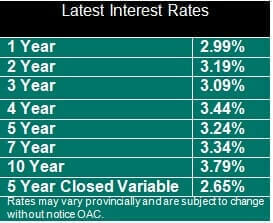 Alternaitvely, you can call or text me at 519-860-2102 and we can go over the mortgage applciation over the phone, which will allow us to go over other details, such as interest rates, alternative financing options, unique circumstances, etc. Please Feel Free to Call or Text me at 519-860-2102. Following your submission I will be in contact, usually within a few hours (maximum 24) to discuss the application prior to processing your application. SELECT YES if you Agree to the Following Terms: Consent to collect and use personal information: I/We, declared the information provided with respect to my/our mortgage application is a true and complete representation of my/our financial situation. I/We understand that it is being used to determine my/our credit responsibility and to evaluate and response to my/our request for mortgage financing. IWe authorize Mortgage Alliance Company of Canada (hereafter referred to as MAC) to obtain a credit report. I/We also authorize MAC to exchange such credit information for the purpose of securing mortgage financing to potential mortgage lenders, mortgage insurers or service providers. MAC is authorized to retain the application and credit information whether or not the mortgage is approved.